Boston Gear’s 200 Series Optimount™ speed reducers are highly adaptable helical reducers that can be configured and applied in an extremely wide variety of mounting positions. Their carefully machined external surfaces permit these reducers to be accurately aligned for use as integral power transmission components within OEM equipment. All 200 Series Optimounts™ come with Boston Gear’s standard lifetime warranty, and you can order them using Reducer Express™. Just ask your customer Service Representative for details. 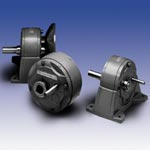 Purchase your Boston Gear Optimount In-Line Helical Gear Drive NOW!